One of the things you need to look at carefully when you do a lot of quilting is just how comfortably you are sitting. 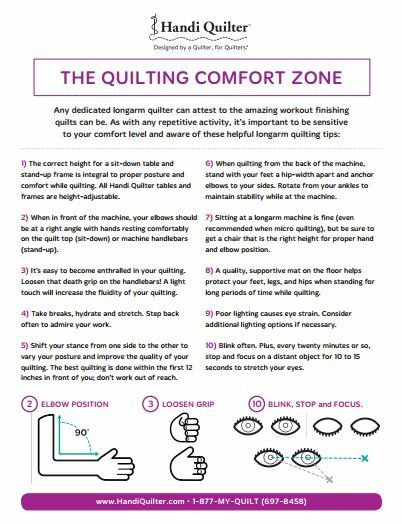 Handi-quilter, the maker of long-arm sewing machines, gives ten rules for comfortable quilting. You can get a copy from the Handi-quilter website. What they say is most relevant to heavy duty quilting machines. Or is it? If you aren’t sitting comfortably you will find quilting a chore rather than a pleasure. I have re-written this for someone quilting on a domestic sewing machine. And after the amount of machine quilting I have been doing recently I know the trickiest bit is getting the machine (and you) at the right height for one another. The correct height of you sewing table is essential for both posture and comfort while quilting. Make sure to get a chair that is the right height for proper hand and elbow position. It must be comfortable and easy to move. When in front of the machine, your elbows should be at a right angle with your hands resting comfortably on the quilt top. You must relax while quilting. Don’t grab the fabric too hard and try to keep your movements fluid. Stop between sections and vary the pace at which you quilt. Take breaks, drink and stretch. Stand up from time to time to admire your work at a distance. Try to work close to your machine — not at arm’s length. And if you’re using a foot control try varying the foot you use. Poor lighting causes eye strain. Think about additional lighting options if necessary.